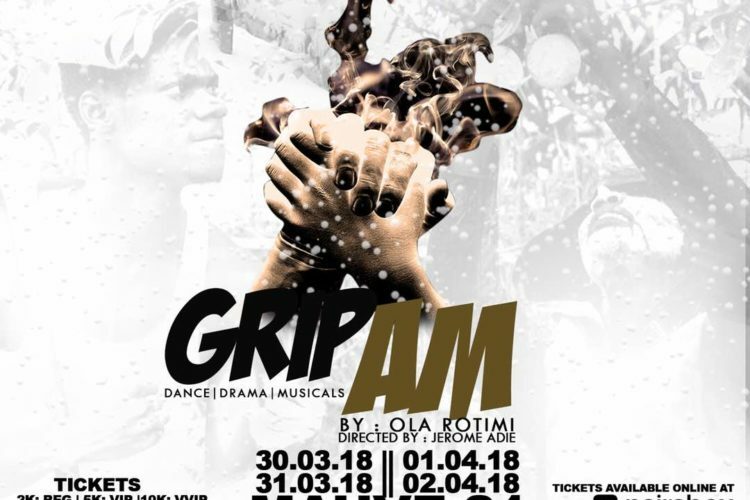 So my friend invited me to come see a stage play (Grip Am) yesterday, at first I was skeptical about going because I didn’t want to waste my rest day on something I won’t enjoy but after a lot of convincing I decided to go. On getting there I discovered the piece isn’t just your everyday kind of piece though the setting of the play depicts everyday human life the metaphorical meaning is deeper than the eyes could see. Apart from the never ending funny punchlines there is the subtle life message passed across in the play What a fusion? This play written by Ola Rotimi, directed by Jerome Adie and produced by The Stage Africa offer a blend of music and drama being creatively delivered by seasoned actors, dancers, musicians and drummers to make you crack your rib out. I promise it is worth every kobo of your naira. Check the picture for details on the rest of the shows.